• Round-trip transfer service from Orlando International Airport to Universal's on-site hotels. • A complimentary travel wallet with pre-printed ticketsand handy resort information. ¥Upon full payment for The Wizarding World of Harry Potter™ Exclusive Vacation Package we will send an E-Travel Document to the e-mail provided at the time of booking. The E-Travel Document will include confirmation instructions, destination information and details about your Shutterbutton's™ Photography Studio session. Valid for one (1) Studio session per room and a maximum of five (5) guests per session. Session includes: one (1) commemorative Shutterbutton’s experience DVD in a Shutterbutton’s Photography Studio DVD case and access to unlimited digital views. Access to digital viewing is provided by Colorvision International Inc. and is subject to additional terms and conditions. Data rates and other charges may apply. Please check with your carrier. ◊◊CityWalk Party Pass℠ valid for fourteen (14) consecutive nights including first day any portion of ticket is used. Not valid for separately ticketed concerts and special events. Some venues require ages 21 or older for admission. Valid photo ID required. Does not include admission to AMC® Universal Cineplex 20 with IMAX®, the Blue Man Group show, or Hollywood Drive-In Golf™. Subject to availability. Restrictions apply and benefits are subject to change without notice. 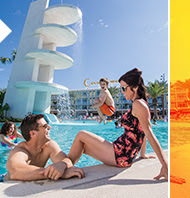 *Rate is per adult, per night, tax inclusive and based on double adult occupancy for 4-night stay at Universal's Cabana Bay Beach Resort, standard room. Subject to availability, room type, hotel, and travel dates selected. Rate valid for bookings 7/1/15 – 12/17/15 and travel Sunday – Thursday; 8/16/15 – 11/24/15, 11/29/15 – 12/17/15 . Number of rooms available on this promotion are limited. Rates are higher on Friday & Saturday nights. Additional on-site hotels, rates and travel dates available. 4-night minimum stay required. Reservations must be made 24 hours in advance. **Rate is per adult, per night, tax inclusive and based on double adult occupancy for 4-night stay at the Loews Royal Pacific Resort, standard room. Subject to availability, room type, hotel, and travel dates selected. Rate valid for bookings 7/1/15 – 12/17/15 and travel Sunday – Thursday; 8/16/15 – 11/24/15, 11/29/15 – 12/17/15 . Numbers of rooms available on this promotion are limited. Rates are higher on Friday & Saturday nights. Additional on-site hotels, rates and travel dates available. 4-night minimum stay required. Reservations must be made 24 hours in advance. †Paid theme park admission required. Benefit not valid for guests staying at Universal’s Cabana Bay Beach Resort; available for purchase only. Not valid at Harry Potter and the Forbidden Journey™, Harry Potter and the Escape from Gringotts™, and other select attractions. Not valid at Hogwarts™ Express. Only valid for the number of guests staying in the room for the length of hotel stay as indicated on the Universal Express℠ Unlimited pass. Available during normal theme park operating hours only. Not valid for separately ticketed special events or Wet 'n Wild. Additional restrictions may apply and benefits are subject to change without notice. ***Rate is per adult, per night, tax inclusive and based on double adult occupancy for a 4-night stay at the Rosen Inn International, standard room. Room type, hotel, and travel dates selected subject to availability. Rate valid for bookings 7/1/15 – 12/17/15 and travel 8/26/15 – 9/30/15, 11/1/15 – 12/22/15. Reservation must be made 72 hours in advance. Additional hotels, rates and travel dates available. 4-night minimum stay required. ^^Reservations required. Transportation schedule and availability are subject to change without notice. Excludes Holiday Inn Club Vacations Orange Lake Resort and Orlando International Resort Club.